My first tiny house project will be the tiny free house, built from shipping pallets and other reclaimed material. It will measure approximately 6′ by 15′ and provide 90 square feet of living space. A sleeping loft will also extend over about half of the floor space to provide sleeping space for two adults. A bathroom and kitchen will be placed below the loft. The main living area will have a tall cathedral ceiling. Why pallets? They are often free and available. If you do a search on craigslist on any day in a large metropolitan area you’ll find free pallets. Pallets go quickly and usually people giving them away prefer that you take them all since to them pallets are a nuisance. I’m not sure how many pallets I’ll need for the house yet but I know there are an endless supply so I’m not too worried. I also assume that I’ll be able to get ride of pallets I don’t want by posting free pallets on craigslist. The only cost should be my time and gas to go pick them up. Free? I plan to spend no money I already have. If I can’t find certain items I need to build the house I’ll find good free stuff on craigslist, clean it up, and try to sell it. In other words the entire project will be financed through finding free stuff and building with it or selling it to buy the stuff I need. The most expensive item I’ll need to buy is a trailer, assuming I can’t find a road worthy one on craigslist. There are a lot of cheap used trailers that are less that $500. I’ll just need to find one that can take the weight of a tiny house. Why? While I don’t need a house myself I’ve been more and more interested and concerned about this whole low cost housing issue. I stumbled on this while writing a book on a related topic, increasing personal freedom. The book is called Do It Yourself Freedom and I’ll have it published soon. The book is about finding simple ways to unburden ourselves giving us back time and money to do the things we really want to do. One of the key solutions is simplifying our homes. It’s an old concept. In the 1800’s transcendentalism was an increasing in popularity and their ideas were very similar to the current tiny house movement. I’m simply hoping to learn and explore ad at the end of the project I should have a tiny house for vacations (retreats) and most likly a book to write. Below are my initial ideas. I’m going to keep it as simple as possible, much like Thoreau’s Walden cabin. I also hope that the simplicity makes it easier for anyone to build a similar project. The pallet wood will be cut and milled so except for the slats there should be little resemblance to a shipping pallet. The structural pieces will be built up from the 2×4 members of the pallets using glue, bolts, and milled to the right size. At the moment I’m hoping to use only simple hand tools, both electric and manual, and avoid any more expensive tools like tale saws, planers, etc. The tool choice should help keep the end product more accessible for the novice builder with a hammer, drill, and circular saw. I’ll post my progress on this project as I make it at tinyfreehouse.com. I’ll also post what I lessons learned to help others build free homes like this. This entry was posted in Tiny Free House and tagged free house, house plan, house plans, tiny house. I really like your blogs and would especially like to write a post and link to this one. 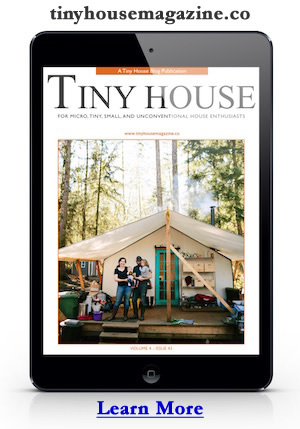 My blog is the http://tinyhouseblog.com/ and I think my readers would enjoy following your quest and progress on the tinyfreehouse and also your ninetinyfeet project as well. Please contact me and let me know if you are ok with this. I came apon your blogs from the tiny house blog by Kent. I appreciate your project a lot. An attempt to build such a house using pallets for timber is going to be….daunting. If I can make any suggestion for you, invest in a good hand edge planer. These can be passed along the edge of the pallet slats to make the straight and smooth, perfect for flooring or siding. Second thought, get rid of the bathroom sink, as there should be little need for two sinks in such a small place. This should give you extra space for a “proper shower” if you want one. At the very least a “proper” shower will prevent a lot of issue with water leakage and mildew that you could have in a “wet” bathroom. Third thought, even if you’re not planning to go solar now, wire your house for 12V when you get to that stage. There is little that won’t do just as well on 12v or have 12v alternatives. This makes it easier if when you DO want to go solar. I am totally new to all this, not that I haven’t been looking for something like this for a while. But here is my dilemma I am over 50 receive disability, with some access to a small amount of money. I do have someone with knowledge of construction. But I am really looking for something totally affordable on my income. If you could guide me I would be in your debt. Kithera, excellent suggestions. I think you’re 100% right about the toilet/sink. As I get into the wood I’ll play with the planer idea. I might even keep my eye out for a good used electric one to buy cheap or trade. In fact I may even dig through the old wood shop at my in-laws farm. My wife’s grandpa was an avid woodworker… he may have just what I need, circa 1930. Old tools in good shape are the best! Old neglected tool are a death trap! Be safe. I am rebuilding my resort and I would like to add something different. Michael, check out a group called Freecycle. It is a place to get free stuff someone else wants to get rid of. It is by geographic areas so you can sign up for a group close to you. Google “freecycle” and you can find it that way.I think via yahoo groups. It is also a good place to get rid of stuff (for free) you don’t want anymore. Hey was wondering if this is even legal…if so I am going to be following you on this adventure because i want to do it myself as well. Currently unemployed but have land to live on, am living w/ my grandparents right now and really would like to move. Please let me know.